There are plenty of reasons for divers to have strong feelings for Mexico’s Yucatán peninsula, typically ranging from spectacular cavern and cave dives in the world famous cenotes to relaxed ocean dives, but as a Course Director I have discovered my new passion for tec diving has opened doors to a whole new world just outside Playa del Carmen. 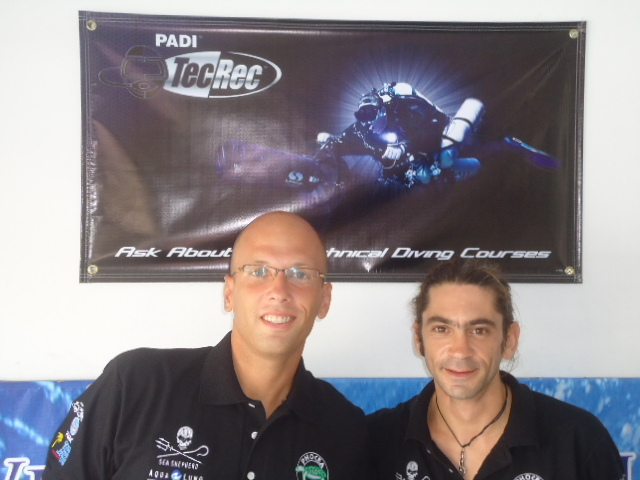 Taking a few days off from work, I have completed my Tec 50 course with Vincent Rouquette-Cathala at PADI CDC and TecRec Center Phocea Mexico. A few hundred metres outside Playa del Carmen the sandy plains suddenly give way to a sheer drop-off starting at about 40 metres deep. Most of the year there are strong currents running along this wall which is covered with immense sponges and coral outcrops. Large pelagic animals such as hammerheads, bull sharks and manta rays are seen frequently in these waters in search of the rich soup of life sustained by upwelling. Unfortunately this environment is also perfect for lionfish as they can reproduce and grow safely beyond the reach of most local divers who sometimes organize “pest control” dives in a desperate but hopeless attempt to eradicate this invasive species. Although a few years ago lionfish were still quite rare in the area, we saw at least one each minute during the deep part of our dives. It was a perfect place for my Tec 50 course, it was challenging but at the same time immensely rewarding. Decompressing in the blue in a strong current and with a surface chop is a little bit like learning to drive in the winter–it takes practice but you will become a very confident driver. After the first two training dives in shallower water spent practicing staging and emergency procedures, and working out our configuration, the third dive was definitely the highlight of the course, especially the last few minutes of decompression, when we were joined by a group of two-metre sailfish. After ten years of diving and teaching I felt as satisfied as on my first dive. I can definitely see the way ahead. Great work mate, Hopefully you will come and do some diving with us “plebs” in NZ again sometime!! Thanks for the coment, i wasn t expecting it…I was actualy about to write you one of this days, i will just do it sooner. NZ is often in the back of my head…it should happen within 5 years. i would even love a have a dive in Pupukee!